The biggest feature is that you can now keep your old counts after changing your URLs. Every website should be HTTPS, both for SEO and security. Chrome will start marking HTTP sites as “Not Secure” which will scare many of your visitors. But it can be painful to see your share counts start over with a new URL. 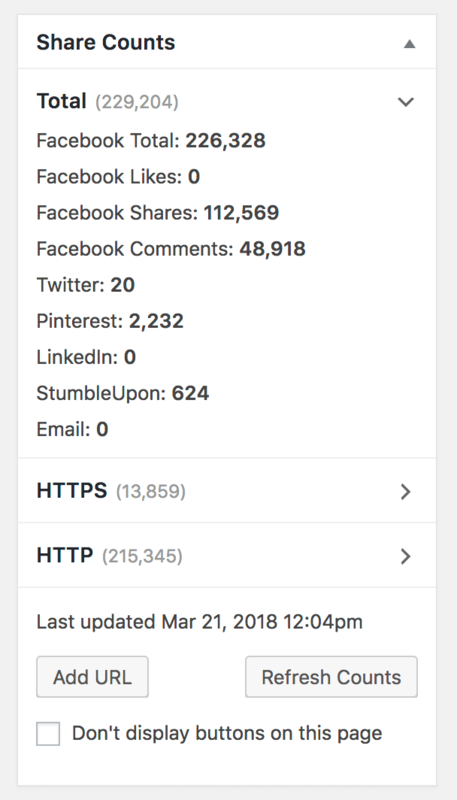 As you can see in the screenshot to the right, one of my clients had 215k shares on the old HTTP version of a URL and only 13k since updating to HTTPS. With most social sharing plugins, he’d only be able to display the smaller count. When you check “Preserve HTTP Counts”, we will request counts for both the HTTP and HTTPS versions of your URL, save them separately, and then add them together before displaying it on the frontend of your site. You can also add additional URLs to check. If you’ve changed the permalink of your post for some reason, you can click “Add URL” and type in the old permalink to include its counts in the listing. There’s no limit on the number of URLs you can query for each post, but it’s important to note that every additional URL is an extra API query. For advanced users, you can use the built-in filters to optimize this. For instance, if you know when you switched over to HTTPS, you can check the post’s published date to determine if you need to retrieve the HTTP counts. New posts only published with HTTPS will have 0 shares with the HTTP version of the URL so there’s no need to make queries for those. We’ve also added a sortable column to the Edit Posts screen that displays the share count. This will allow you drill down deeper into the data, finding your popular content inside a specific category or month. When editing a post, you can refer to the “Share Counts” metabox in the right column for a breakdown of your total count by service and URL. Since we store the total share count as its own meta key (shared_counts_total), you can use this in your WordPress queries on the frontend to display popular posts based on share count. On client sites we often include a “Popular Posts” section that displays 3 posts in the same category. We highly recommend you sign up for a free account at SharedCount.com and use its API to retrieve counts. It’s a single API query for Facebook, Pinterest, and StumbleUpon counts, and seems to be more predictable than the native Facebook API. The free account includes 1,000 API queries/day. If you connect your Facebook account they’ll increase it to 10,000 API queries/day. This should be plenty for any website with less than 5,000 posts. If you are running out of API queries, you can tweak the update frequency here. You may be familiar with our earlier share count plugin, EA Share Count. We started development three years ago, and publicly released it two years ago. We’ve continued to refine it over the years, and 90% of Shared Counts’ code came directly from that earlier plugin. You’ll see “0 shares” on all your posts initially while your cache builds over 24-48 hours. For advanced users, you can use wp cli to rename the post meta keys to preserve your EASC cached counts rather than waiting for it to rebuild. Any customizations you’ve made using filters to EA Share Count will need to be updated to work with Shared Counts. Almost all the filters work exactly the same in both plugins but just have different names. You’ll also want to update any CSS customizations to use the new CSS classes. Shared Counts has been in development for over 6 months, so we’re happy to finally make it available everyone with a proper brand it deserves. Unlike EA Share Count, Shared Counts is available through WordPress.org, so its easy to install with a few clicks from within your site. Additionally, the project is available on GitHub for collaboration and bug reports. We’re really proud of this plugin, and we hope you enjoy it and find it useful! If you have any questions, just leave a comment below. TwentyTen CRM is a theme specifically designed to manage your customers, from initial contact to project completion. It’s highly customizable and free. This shortcode will let you easily list posts based on tag and/or category, limit the number of posts displayed, and sort the results. If you’ve ever wanted to list posts on your site without editing theme files, this is the tool for you. And then I see this and it seems to be a pretty blatant rip-off of our product, Social Warfare. From the available styles, to even the WordPress Repo image (just compare them side-by-side) this really feels like a slap in the face. Yes, the repo image was similar. Our designer was inspired by yours – Jared and I never compared them before launch – and we’ve now redesigned it. But that’s where the similarities end. This is a plugin we’ve developed and iterated on for over three years. It was built specifically to solve performance issues we found in all the social sharing plugins on the market. It was also built to be easily extended by developers like ourselves, without the backend & frontend bloat that had prompted us to build custom solutions for our clients to begin with. We never looked at your style options – those were pulled from styles we’ve commonly used on client sites over the years. I wasn’t aware “Social Recovery” was a feature of your pro plugin. Many of our clients came to us asking for that feature, so we built it. This was a plugin developed to scratch our own itch. After three years, it’s mature enough that we’re comfortable sharing it on WordPress.org for others to use. Shared Counts wasn’t designed to be perfect for everyone, and I’m sure many people will continue to use Social Warfare for its unique features. But I think Shared Counts serves a specific need – a free, simple, performant way to display social sharing plugins. For a lot of sites we use Soical Warfare Pro but when I asked them if they had a developer guide to adding a custom button (for print) they basically told me “no good luck”, in very nice polite words which as a developer I respect, we all have limits to what level of support and documentation we provide… you’ve already got documentation for it https://github.com/jaredatch/Shared-Counts/wiki/Additional-Share-Buttons. Thanks Jon! Let me know if you run into any issues. It might be a good idea to have both plugins running on the site for a few days so you can prime the cache. Call shared_counts()->core->counts() somewhere in the theme so it retrieves the counts for that post. When you disable the current share plugin and start using Shared Counts for the actual buttons, all the articles will show accurate counts. This plugin sounds just what I’m looking for. Is it compatible with the new WordPress 5.0? Yes, it is compatible with WordPress 5.0. We don’t have a custom block built yet, but a future release will likely build a “Shared Counts” block to replace the Shared Counts shortcode. The good news was that after installing your plugin the pageload time stayed just about the same. Very light footprint, I like it. So well done and thanks.